Verschillende Palestijnse groeperingen in Gaza hebben zaterdag verklaard dat ze bereid zijn tot een staakt-het-vuren, indien ook Israël de gevechten stopt. De voorbije weken escaleerde het geweld in en rond Gaza. Er kwamen al minstens tien Palestijnen om het leven bij aanvallen van het Israëlische leger. Voor het eerst sinds lang vond ook een dodelijke aanslag plaats op Israëlisch grondgebied. Verschillende Palestijnse groeperingen kwamen zaterdag bijeen om zich te beraden over de te volgen strategie. Na afloop verklaarde Hamas, dat aan de macht is in Gaza, bereid te zijn tot een staakt-het-vuren als tenminste ook Israël de aanvallen stopt. De Fatah-partij van president Mahmoud Abbas was niet op de vergadering aanwezig. De president had eerder op de dag in Ramallah wel een ontmoeting met vertegenwoordigers van Hamas. Het ging om een eerste publieke bijeenkomst in minstens twee jaar tussen de rivaliserende fracties. De ontmoeting verliep in een zeer goede sfeer, zo luidde het. Abbas zou binnenkort een bezoek brengen aan Gaza, om de verkiezingen in de Palestijnse gebieden voor te bereiden. The United Nations Reporter, Richard Falk, said that Israel carried out ethnic cleansing in Palestine. Ethnic cleansing, apartheid and colonialism are the actions that Israel has practiced in the Palestinian territories, the United Nations Reporter for the Occupied Palestinian Territories, Richard Falk, said Monday through a report that was presented at the Human Rights Council of the multilateral agency. The speaker defined the Israeli behavior and actions as acts of “ethnic cleansing and apartheid,” because of the restrictions, massacres and wars that originated against the neighboring people. The Falk report was delivered to the UN Human Rights Council in Geneva (Switzerland), in order to highlight the level that Israel has had in fulfilling the obligations which come from international law regarding the situation in the occupied territories. Falk uses words in the document such as “annexation, ethnic cleansing, apartheid, colonialist and crime” in order to adequately describe “the real nature of the situation prevailing in the occupied Palestinian territories,” he said. “Israeli settlers have taken over Palestinian homes and expelled the Palestinians from their homes for decades and generations, while the Israeli authorities support their illegal actions,” said the UN Reporter. The term “apartheid” is not linked specifically to the racist policies that were implemented in South Africa, but today is a crime associated with any institutionalized systematic oppression of one racial group over one or more racial groups and with the intention of maintaining that regime,” he said. Falk, in this regard, suggested to refer the case to the International Criminal Court to confirm the definition of apartheid as well as clarify whether the continued practice of illegal settlements and expulsions in East Jerusalem can be considered ethnic cleansing. The UN Reporter believes that Israel is unwilling to make an account in a credible form, because in addition to denying entry into the Palestinian territories, it has not responded to allegations made in reports on the Israeli offensive in Gaza and attacks on the humanitarian flotilla. “So the international community begins to have a strong impression that there is a lack of political will to implement the recommendations based on reasonable conclusions that Israel has been guilty of gross violations of international humanitarian law and international criminal law” he said. “There is a feeling that no one wants to implement the recommendations. There is a widespread perception of impunity encouraged with regard to the conduct of Israel,” emphasized the reporter. “This attitude of non-cooperation with official missions of the Human Rights Council should lead this body and the Office of the Secretary General to take concerted action to do everything possible to ensure the future cooperation of the government of Israel,” Falk concluded. Libië is een zwart-wit verhaal en in Egypte en Tunesië is er nog geen revolutie. Dat is de analyse van docent Arabistiek en Islamkunde aan de KULeuven John Nawas tijdens een lezing op woensdag 23 maart van de Leuvense studentenverenigingen Dyma en Politika. Despite the uptick in violence, it’s going to require something truly nasty or spectacular to put the Israeli-Palestinian issue on the front burner again. The fact is that there is truth to both narratives; but, both have now been overtaken by another reality — an Arab spring and winter that have captured the attention and imagination of the peoples of this region and the world. These profound changes have created a new set of priorities and agenda that has set the Palestinian issue in a new light, reducing to a much tinier scale the grim, rather hopeless shepherd’s war we call the Israeli-Palestinian conflict — whether it’s waged with rockets or knives. The empty promises of the peace process have done the rest. To put this in perspective, look at the three-week-long Israeli-Hamas war in 2008-2009. It was short, cruel, and brutal; and it changed absolutely nothing. By contrast, the Arab spring/winter has been profound and transformative; it has changed much, with much more yet to come. Arabs and Muslims will certainly continue to be compelled by the power of the Palestinian issue, but the days when manipulative leaders can use Palestine as a rallying cry to mask their own abusive behavior may be numbered. For those countries that have peace treaties with Israel (Egypt, Jordan) Arab publics will finally have to own those relationships — rather than leave them in the autocrats hand — and decide for themselves whether or not they make sense. Do Arab springs reflect the end or the erosion of the resonance of the Palestinian issue in Arab politics? Hardly. In emerging democratic and semi-democratic polities, new voices will abound and demand to be heard. Secularists and Islamists — not to mention extremists of all stripes — will keep Palestine alive as a rallying cry. But this time, it’s going to require something truly transformative to put it back on the front burner. Across the Arab world, the focus is now on elections, constitutions, and the revolutions yet to come. To paraphrase the British rock group The Who, the Arab public won’t get fooled again by some chimerical quest to redeem Palestine. The same old, same old isn’t good enough anymore. Conventional diplomacy or conflict won’t be enough to re-energize the Arab world — or the Israelis and Palestinians, for that matter. You’d need a confrontation so volatile that it forces Israelis and Palestinians to reassess, or a peacemaking initiative so grand that it shakes up calculations in a dramatic way. Neither is likely. The other potential? A Palestinian spring that harnesses people power as effectively and as peacefully as those that have occurred in the Arab world. Always an option, but I wouldn’t bet on it. Instead, I’d put my money on an Arab spring, as messy as it is, which is proving to be one of the most extraordinary political developments of this century — not on a tired, stalemated conflict that lacks visionary leadership, smart political tacticians, and new generational spirit. That’s an old movie, a rerun actually; and nobody — not even the Arabs — are watching. Breakfast at a Tripoli hotel housing international journalists took a decidedly grim turn Saturday when a desperate Libyan woman burst into the building frantic to let the world know she had been raped and beaten by Moammar Gadhafi’s militia. Her face was heavily bruised. So were her legs. She displayed blood on her right inner thigh. She said her name was Eman al-Obeidy. She was well-dressed and appeared to be a well-to-do middle-aged woman. She spoke in English and said she was from the rebel stronghold of Benghazi and had been picked up by Gadhafi’s men at a checkpoint east of Tripoli. She sobbed and said she was held against her will for two days and raped by 15 men. She showed the journalists how she had been tied at her wrists and ankles. She had visible rope burns. CNN could not independently verify al-Obeidy’s story but her injuries appeared consistent with what she said. Government officials quickly closed in to stifle her. But she persisted, wanting the journalists, staying at the Rixos Hotel, to see Gadhafi’s brutality firsthand. International journalists, including CNN’s staff, are not allowed to move freely in the Libyan capital and are escorted out of the hotel only on organized outings by government minders. This was the first time a Libyan opposed to Gadhafi attempted to independently approach the journalists here. What followed was a disturbing scene of how Gadhafi’s government operates. Security forces moved to subdue the woman. Even a member of the hotel’s kitchen staff drew a knife. “Traitor!” he shouted at her in contempt. Another staffer tried to put a dark tablecloth over her head. One government official, who was there to facilitate access for journalists, pulled a pistol from his belt. Others scuffled with the journalists, manhandling them to the ground in an attempt to wrestle away their equipment. Some journalists were beaten and kicked. CNN’s camera was confiscated and deliberately smashed beyond repair. Security men said al-Obeidy was “mentally ill” and was being taken to a “hospital.” They dragged her unceremoniously to a waiting white car. She kicked and screamed. She insisted she was being carted off to prison. The journalists believed al-Obeidy’s life to be in danger and several of them demanded to see her. At a news conference later, they challenged Libyan Deputy Foreign Minister Khaled Kaim on what they had experienced. Kaim told them that authorities were investigating the incident. “We will let you know,” he said. The incident served as stark reminder of Gadhafi’s pervasive grip on Libyan society. A woman who dared to speak against him was quickly silenced. Journalists who dared to tell her story paid a price. It was one tale that perhaps went a long way in illuminating the need to protect Libya’s people. The interview came one day after after the Yemeni president spoke to thousands at a pro-government demonstration in an effort to underscore his intentions to have a dialogue with anti-government protesters and make concessions to avoid bloodshed. Protesters have called for the ouster of Saleh, who has ruled Yemen since 1978. The country has been wracked by a Shiite Muslim uprising, a U.S.-aided crackdown on al Qaeda operatives and a looming shortage of water. Protesters cite government corruption, a lack of political freedom and high unemployment that have fueled much of the anger among a growing young population steeped in poverty. Saleh had promised not to run for president in the next round of elections. But Yemen’s parliament this week approved a 30-day extension of emergency powers Saleh declared last week in response to protests. The emergency law expands the government’s powers of arrest, detention and censorship. De opstandelingen in Libië hebben de strategisch belangrijke olieplaats Ajdabiya heroverd. Het is hun eerste succes sinds de troepen van Kadhafi hen ver naar het oosten terugdrongen. De internationale coalitie heeft de opstandelingen geholpen door tanks en artillerie rond de stad te bombarderen. Het regime zegt dat de coalitie zich daarmee niet aan haar VN-mandaat houdt. Rond de stad Misrata die in handen is van de opstandelingen wordt zwaar gevochten. Ook daar voert de coalitie luchtaanvallen uit. In Misrata zijn de afgelopen week zeker 115 doden gevallen, zeggen ooggetuigen. In Syrië hebben ordetroepen traangas gebruikt tegen jonge demonstranten die een sit-in houden op het centrale plein in de stad Daraa. De honderden betogers eisen het vertrek van president Assad. Ook staken ze een politiebureau en een kantoor van de regerende Baath-partij in brand. De afgelopen week zijn Syriërs massaal de straat opgegaan. Via Facebook is opgeroepen tot nieuwe demonstraties. Gisteren liet de regering 200 politieke gevangenen vrij om de betogers tegemoet te komen. In minstens acht steden werd gedemonstreerd uit woede over eerder gedode betogers. Het leger greep in en daarbij vielen zeker 23 doden. 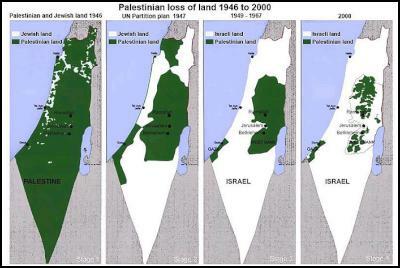 If the international community has abandoned its responsibilities towards Palestinians, and particularly towards Gaza, as the above examples over the last 63 years plus this map of Palestinian territories so graphically illustrate, what else is left to Gaza but self-defense? Israel and its chorUS disingenuously cite Israel’s right of “self-defense” to justify not only Israel’s disproportionate military response to Gaza – and Palestinians’ – genuine right to self-defense, but also to attempt to disguise Israel’s blatant land-theft from existing citizens. Contrast the “newcomers” in Israel, for example, to many of those who in recent years have arrived in Australia. The latter have been considered illegal immigrants and incarcerated in off-shore islands or desert detention camps –the subtle distinction being that (i) those latterly arriving in Australia sought refuge from repressive regimes whereas the Israeli immigrants came from European and North American democracies…(enough said, perhaps) and (ii) unlike Australia’s (and New Zealand’s) immigrants, who now accept the existing population’s rights to their existing property, culture and citizenship, Israel’s immigrants bulldoze and destroy the homes of existing residents to build their own in their place, not only rendering thousands homeless but also destroying historic, economic and culturally-important sites such as religious buildings, olive groves, farms, and cemeteries – and now legislating that they also be of the jewish religion in order to have citizenship. Is not our perception of the wrongness of such actions why New Zealanders, for instance, just spent thirty years redressing such wrongs in their own country, through the Waitangi Tribunal? Is not our perception of the wrongness of such discrimination why we all fought to end similar structural apartheid in South Africa? After a cosy telephone chat to US President Obama, Israeli Prime Minister Netanyahu on Thursday said from Moscow that “Israel’s reaction to rocket attacks will be measured” (7) – but by what, is the question…caesium, perhaps? A quick glance at the map reveals US, British and EU troops in the midst of massive military operations in oil-rich Libya from the west, Israel launching sustained military attacks against a potentially-unified Gaza/Palestine from the east and north – and slap bang in the middle, a very desirable waterway in the middle of a country which recently overthrew its USrael-friendly president, but which has yet to establish a categorically different regime…and whose military rulers have not opened the Rafah Crossing into Gaza, but today reiterated their prior commitment “ to Egypt’s international treaties in an early message to reassure Jerusalem and the United States,” according to the Jerusalem Post’s reporting of Thursday’s meeting in Cairo between Egyptian Foreign Minister Nabil Elaraby, and Rafi Barak, a senior Israeli Foreign Ministry official. Yes, on any reading of the situation, Gaza certainly does have good cause for concern about their security and territorial integrity. In the face of continuing military attacks against civilian targets and the absence of any meaningful and/or enforceable UN Security Council Resolution to protect them, and of any meaningful assistance from the international community in preventing Israel’s ongoing use of force, they have every legitimate reason to resort to self-defense, under Article 52 of the UN Charter. It is true that jihad is one of the most important teachings of Islam. But jihad is not synonymous with war. In Islam another word is used for war and fighting. This word is ‘qital.’ When the Qur’an refers to war or fighting, it uses the word qital and not jihad. The Qur’an is simply a book, and not a sword, so “do great jihad with the Qur’an” means do great jihad with the ideological power of the Qur’an. In fact, jihad is only another name for peaceful activism. And peaceful activism is the only weapon by which Islam wants to achieve all its aims and objectives. In the Qur’an and the Hadith, there are many such references that go to prove that Islam is a religion of peace, love and human brotherhood. However, it is also a fact that in later times the image of Islam has altered drastically. Now Islam has come to be regarded as a religion of violence rather than as a religion of peace. It is not the media that has produced this transformation in the image of Islam. The responsibility for this falls on latter-day Muslims, who have failed to maintain the original image of Islam. Nowadays, the meaning of jihad is identical with qital. It is a long with the issue that face by Islamic world especially conflict in Middle East. It’s point of view, emphasize jihad to fight people or nation whose doesn’t suitable with Islamic teaching. It cause them framed in horrible meaning of jihad, where jihad means “execution’s project” toward government suspected thaghut, included the official of military, police etc. Later on, their attitude become sectarian’s attitude and it triggers a new war between nation and kind of Islamic sect, that cause many victim from civilian. It’s the new face of jihad, but however Islam refuse it and even it’s not suitable with the actor’s imagine. For that reason, we have to back the real meaning of jihad and qital. Jihad is debatable and interpretable terminology. Generally there are two ways in seeing the meaning of jihad namely exoterically and esoterically. Exoterically means the holy war while esoterically means the real effort to get close to Allah SWT. Terminology of Ijtihad derived from j-h-d, means the ability to analyze and conclude the teaching’s law. Some experts see, the meaning of jihad as holy war influenced by Christian concept. Based on Al Quran and Hadist jihad and war have different meaning. Where Allah SWT permit war to defend our self from the infidel’s disturbance. As stated in holy Quran al-Baqarah: 190-194, and an-Nisa: 75-78. Based on Hadist there are some ethics in war. First, war in the path of Allah has to invite the rival to pious toward Allah SWT. Second, don’t kill the children. Third, before attack the rival, we have to use diplomatic ways and ask them proves into Islam. Fourth, if they refuse to prove Islam asks their tax for security and life guarantee, and they are in Islamic protection. Muslim has to keep and respect their right. When war couldn’t be avoided, it is better for you to do diplomatic rather than military approach. The prophet saying, “ war is trick/strategy/diplomatic. Dealing with the Hadist, Ibnu Hajar al-‘Asqalany explain “war” with diplomacy is better than physical war. it is better to be implemented at recent time since many people suspect physical war is better than diplomacy. There is a mistake in generalizing jihad and qital. According to Gamal Al-Banna (Jihad, 2006) the mistake caused by: First, people who talk about jihad use the verse of holy Quran without seeing the background of the verse sent down. Actually we couldn’t learn al Quran partially, since Al Quran sometime talking about a theme in certain verse. So collaborate all verses that dealing with qital is a must and decide a law based on conclusion from it collaboration. Second, they suspect that jihad and qital have the same meaning, without seeing the real meaning of jihad and qital. Finally they conclude that “sacrifice our self” is the highest position in jihad. Third, they don’t understand that qital in Islam is not purposed to get loot of war, sectarianism, racism or to get world’s happiness. Fourth, they use qital as too in spreading the teaching and invite people become Muslim by introducing the God’s kingdom. It is a danger paradigm that threats the freedom of faith, and plunge us into radicalism. Fifth, they tend to use Hadist rather than holy Quran, since Hadist explains more about jihad and qital. Sixth, there is a role of Ulama that generalize qital with jihad, where it followed by their dare that jihad is similar with qital. Jihad and qital is not the same. Jihad means the serious effort to get Allah’s pleasure. Jihad is contrary with violence even terrorism. In holy Quran stated qital used in certain condition. In holy Quran, war license is always followed by the saying wa la ta’tadu (do not over limit and law of Allah SWT).